Porter’s Five Forces analysis is a framework that helps analyzing the level of competition within a certain industry. It is especially useful when starting a new business or when entering a new industry sector. According to this framework, competitiveness does not only come from competitors. Rather, the state of competition in an industry depends on five basic forces: threat of new entrants, bargaining power of suppliers, bargaining power of buyers, threat of substitute products or services, and existing industry rivalry. The collective strenght of these forces determines the profit potential of an industry and thus its attractiveness. If the five forces are intense (e.g. airline industry), almost no company in the industry earns attractive returns on investments. If the forces are mild however (e.g. softdrink industry), there is room for higher returns. Each force will be elaborated on below with the aid of examples from the airline industry to illustrate the usage. New entrants in an industry bring new capacity and the desire to gain market share. The seriousness of the threat depends on the barriers to enter a certain industry. The higher these barriers to entry, the smaller the threat for existing players. Examples of barriers to entry are the need for economies of scale, high customer loyalty for existing brands, large capital requirements (e.g. large investments in marketing or R&D), the need for cumulative experience, government policies, and limited access to distribution channels. More barriers can be found in the table below. The threat of new entrants in the airline industry can be considered as low to medium. It takes quite some upfront investments to start an airline company (e.g. purchasing aircrafts). Moreover, new entrants need licenses, insurances, distribution channels and other qualifications that are not easy to obtain when you are new to the industry (e.g. access to flight routes). Furthermore, it can be expected that existing players have built up a large base of experience over the years to cut costs and increase service levels. A new entrant is likely to not have this kind of expertise, therefore creating a competitive disadvantage right from the start. However, due to the liberalization of market access and the availability of leasing options and external finance from banks, investors, and aircraft manufacturers, new doors are opening for potential entrants. Even though it doesn’t sound very attractive for companies to enter the airline industry, it is NOT impossible. Many low-cost carriers like Southwest Airlines, RyanAir and EasyJet have succesfully entered the industry over the years by introducing innovative cost-cutting business models, thereby shaking up original players like American Airlines, Delta Air Lines and KLM. This force analyzes how much power and control a company’s supplier (also known as the market of inputs) has over the potential to raise its prices or to reduce the quality of purchased goods or services, which in turn would lower an industry’s profitability potential. The concentration of suppliers and the availability of substitute suppliers are important factors in determining supplier power. The fewer there are, the more power they have. Businesses are in a better position when there are a multitude of suppliers. 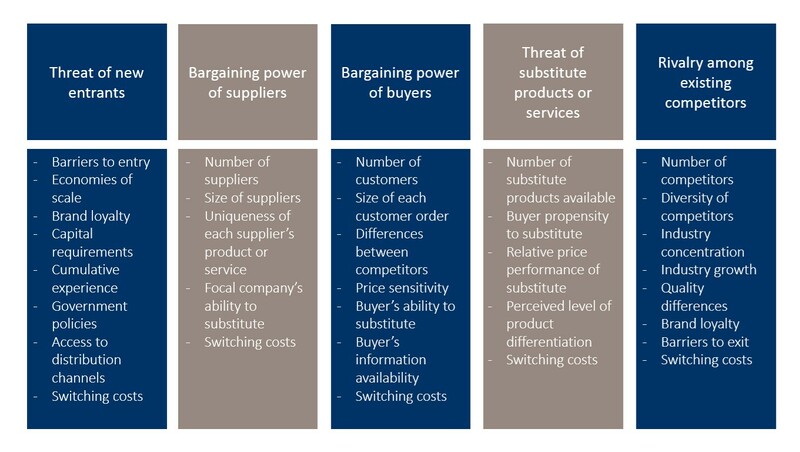 Sources of supplier power also include the switching costs of companies in the industry, the presence of available substitutes, the strength of their distribution channels and the uniqueness or level of differentiation in the product or service the supplier is delivering. The bargaining power of suppliers in the airline industry can be considered very high. When looking at the major inputs that airline companies need, we see that they are especially dependent on fuel and aircrafts. These inputs however are very much affected by the external environment over which the airline companies themselves have little control. The price of aviation fuel is subject to the fluctuations in the global market for oil, which can change wildly because of geopolitical and other factors. In terms of aircrafts for example, only two major suppliers exist: Boeing and Airbus. Boeing and Airbus therefore have substantial bargaining power on the prices they charge. The bargaining power of buyers is also described as the market of outputs. This force analyzes to what extent the customers are able to put the company under pressure, which also affects the customer’s sensitivity to price changes. The customers have a lot of power when there aren’t many of them and when the customers have many alternatives to buy from. Moreover, it should be easy for them to switch from one company to another. Buying power is low however when customers purchase products in small amounts, act independently and when the seller’s product is very different from any of its competitors. The internet has allowed customers to become more informed and therefore more empowered. Customers can easily compare prices online, get information about a wide variety of products and get access to offers from other companies instantly. Companies can take measures to reduce buyer power by for example implementing loyalty programs or by differentiating their products and services. Bargaining power of buyers in the airline industry is high. Customers are able to check prices of different airline companies fast through the many online price comparisons websites such as Skyscanner and Expedia. In addition, there aren’t any switching costs involved in the process. Customers nowadays are likely to fly with different carriers to and from their destination if that would lower the costs. Brand loyalty therefore doesn’t seem to be that high. Some airline companies are trying to change this with frequent flyer programs aimed at rewarding customers that come back to them from time to time. The existence of products outside of the realm of the common product boundaries increases the propensity of customers to switch to alternatives. In order to discover these alternatives one should look beyond similar products that are branded differently by competitors. Instead, every product that serves a similar need for customers should be taken into account. Energy drink like Redbull for instance is usually not considered a competitor of coffee brands such as Nespresso or Starbucks. However, since both coffee and energy drink fulfill a similar need (i.e. staying awake/getting energy), customers might be willing to switch from one to another if they feel that prices increase too much in either coffee or energy drinks. This will ultimately affect an industry’s profitability and should therefore also be taken into account when evaluating the industry’s attractiveness. In terms of the airline industry, it can be said that the general need of its customers is traveling. It may be clear that there are many alternatives for traveling besides going by airplane. Depending on the urgency and distance, customers could take the train or go by car. Especially in Asia, more and more people make use of highspeed trains such as Bullet Trains and Maglev Trains. Furthermore, the airline industry might get some serious future competition from Elon Musk’s Hyperloop concept in which passengers will be traveling in capsules through a vacuum tube reaching speed limits of 1200 km/h. Taken this altogether, the threat of substitutes in the airline industry can be considered at least medium to high. 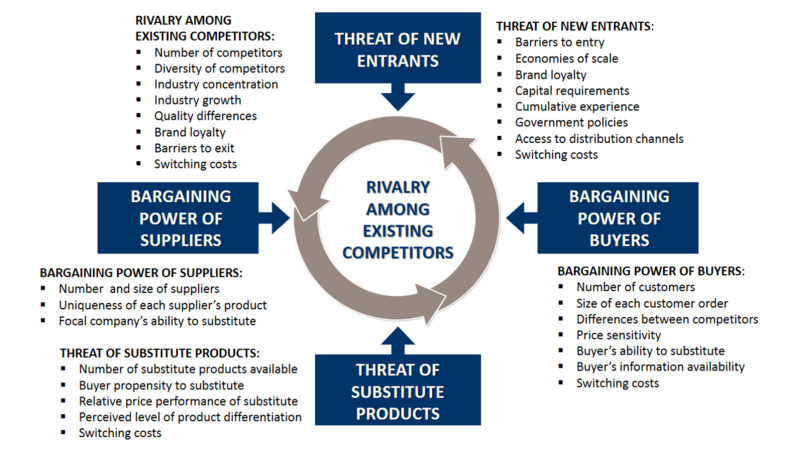 This last force of the Porter’s Five Forces examines how intense the current competition is in the marketplace, which is determined by the number of existing competitors and what each competitor is capable of doing. Rivalry is high when there are a lot of competitors that are roughly equal in size and power, when the industry is growing slowly and when consumers can easily switch to a competitors offering for little cost. A good indicator of competitive rivalry is the concentration ratio of an industry. The lower this ration, the more intense rivalry will probably be. When rivalry is high, competitors are likely to actively engage in advertising and price wars, which can hurt a business’s bottom line. In addition, rivalry will be more intense when barriers to exit are high, forcing companies to remain in the industry even though profit margins are declining. These barriers to exit can for example be long-term loan agreements and high fixed costs. When looking at the airline industry in the United States, we see that the industry is extremely competitive because of a number of reasons which include the entry of low cost carriers, the tight regulation of the industry wherein safety become paramount leading to high fixed costs and high barriers to exit, and the fact that the industry is very stagnant in terms of growth at the moment. The switching costs for customers are also very low and many players in the industry are similar in size (see graph below) leading to extra fierce competition between those firms. 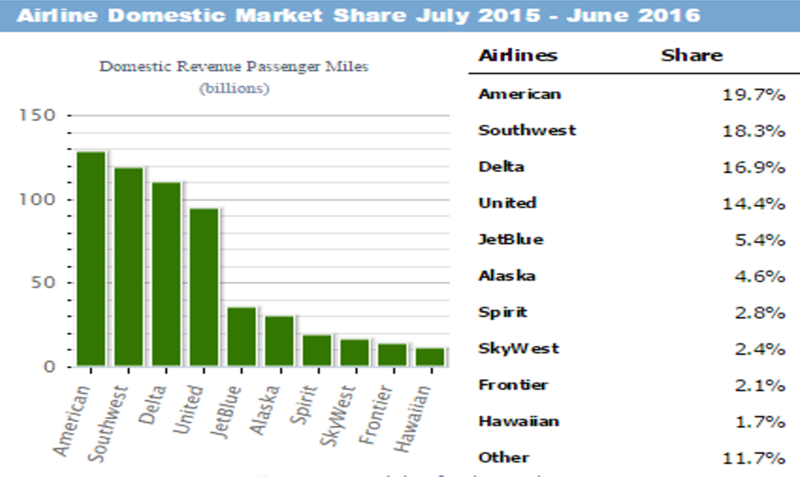 Taken altogether, it can be said that rivalry among existing competitors in the airline industry is high. By looking at each competitive force individually, you are able to roughly map out the focal industry and its attractiveness. Note that industries might differ in terms of attractiveness depending on the country you are looking at. Government policies are for example likely to be different in each country and also the amount of suppliers and buyers might vary from nation to nation. Porter’s Five Forces is a good starting point to evaluate an industry but should not be used in isolation. You could for example combine it with a Value Chain Analysis or through the VRIO Framework in order to get a better sense of where your company’s competitive advantage is coming from and to better position your company between the rivals. Moreover, Porter’s Five Forces is often combined with the PESTEL analysis to give a good overview of the organization’s environment. Lastly, it should be said that the framework also received some criticism from several authors. Some authors have for instance argued that the model needs a 6th force called the ‘complementors’, in order to explain the reasoning behind strategic alliances and joint ventures. This extended model is also known as the Value Net Model. However, even though the criticism it got, Porter’s Five Forces is still one of the most used frameworks for strategy development and is likely to remain that way in the near future.